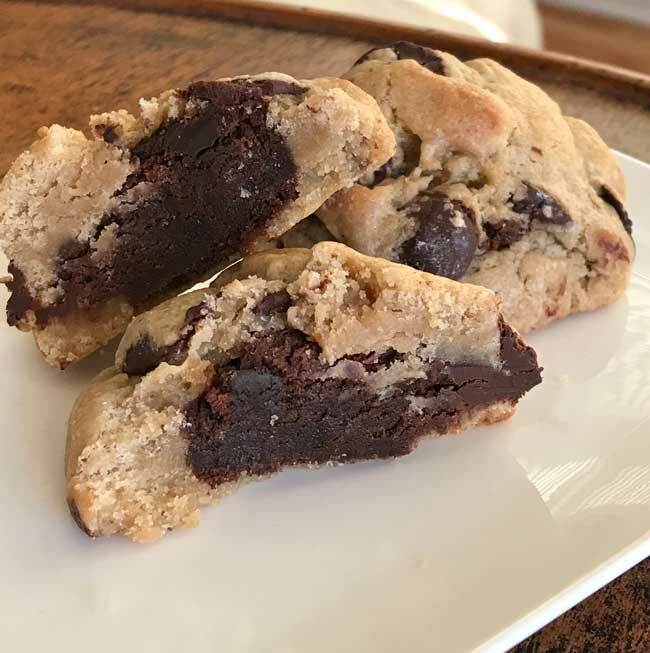 These chocolate chip cookies stuffed with brownies are variations on pillow cookies. I like the original recipe, but wanted to make a version with less baking powder. This is it. You’ll have enough dough for 10 Brownie Stuffed Chocolate Chip Cookies. 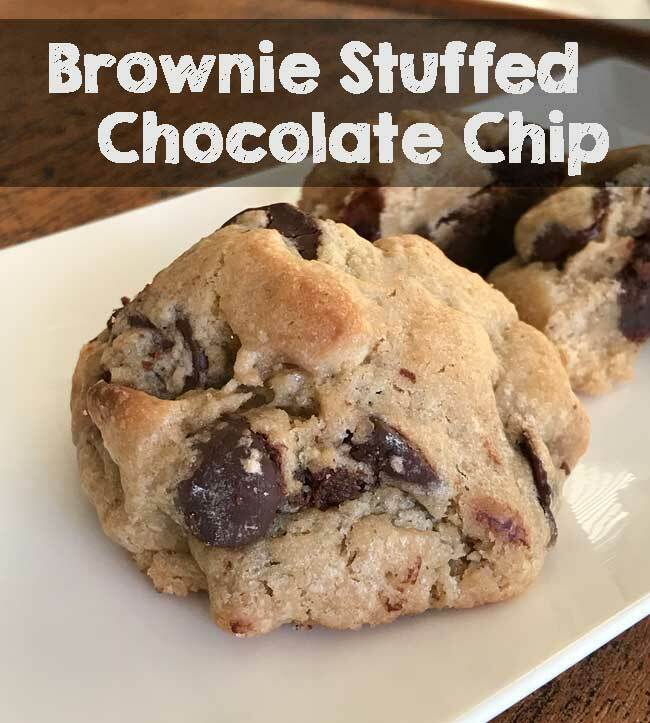 Big, fat, chocolate chip cookies stuffed with squares of brownie. Don't preheat the oven yet because dough needs to chill. In a mixing bowl using high speed of an electric mixer, beat the butter and brown sugar until creamy. Reduce mixer speed to low and beat in the egg and vanilla, beating just until mixed. Do not overbeat. With mixer still on low, beat in the salt and baking powder. With a large mixing spoon, gradually stir in the flour. When flour is mixed in, add the white chips and the chocolate chips. Have ready a couple of dinner plates lined with plastic wrap. Scoop out 10 evenly portioned gobs of dough. Wrap each gob around a frozen brownie cube, then cover and chill for several hours or overnight. Arrange 5 cookies on a baking sheet (or use two baking sheets and put 5 cookies on each). Bake on parchment lined sheets for 12-15 minutes. Let cool on baking sheets for about 5 minutes, then carefully transfer to a wire rack to cool completely. I like to bake these in a convection oven, as they seem to spread less. If you don't have a scale, be sure to aerate (stir and fluff up) your flour before measuring. I’ve made the buttersweet cookies and they are always a hit. As a variation for the cream cheese filling, you can use chopped maraschino cherries, coconut, or the nuts this recipe used, or any combination of the above. One of my recipes uses a vanilla glaze instead of the chocolate glaze with the cherry filling. This cookie seems to be delicious anyway you decide to make it. Nice collection. I vote for the chocolate ravioli or the chocolate cranberry caramel bars. I guess I’m a fruit with my chocolate mood today. Oh fun! I see they have Anise cookies on there. I grew up with those as “the” Christmas cookie every year. Now I don’t make them because it’s too much work with all the others I make for my party. I’ve been posting my recipes and pictures as well. Party is Saturday. I’ve made 16 things for it. Whew! Glad I’m done! Oddly enough, I still want to bake. I just don’t want to do any more dishes. I look forward to your next review too! That is an impressive collection of cookies! Thanks for sharing! I’m trying to decide whether or not I would like anise flavoring in roll out cookies as listed in one of the recipes. Hmmmm? Oh my, what a collection of cookies! Thanks for sending…not sure I know which one I want to try either!